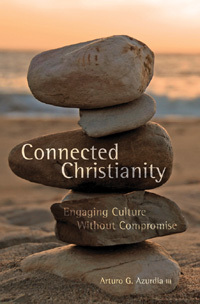 Connected Christianity is a refreshing look at the responsibility before Christ-followers in godless culture. Art Arzurdia writes with the patience of a tender-hearted pastor and the depth and breadth of a well-grounded Reformed theologian. “I do not ask that you take them out of the world, but that you keep them from the evil one” (John 17:15, ESV). “As you sent me into the world, so I have sent them into the world” (John 17:18). The remainder of the book directs the attention of the reader to Christ. Arzurdia includes an excellent treatment of Christ’s redemption that is particular in nature. Jesus is presented as our Great High Priest who is supreme above all, uniquely qualified, and perfectly compassionate; One who will enable his people to fulfill the his mandate. Connected Christianity is a good book. It will undoubtedly get people talking. Azurdia’s assertions are biblically grounded and challenging. He has effectively navigated the chasm between license and legalism and carefully guides the reader on the correct path that engages the culture without compromise.